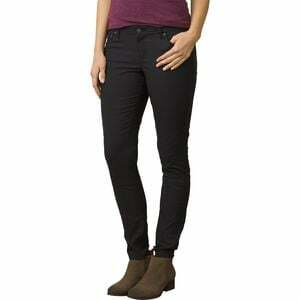 Product Condition: The Jenna Pant - Women's is in Excellent condition. These pants were previously owned for three weeks. The following observations were made regarding these item. *They were slightly used for an occasion. There aren't any defects in them at all. *They got lots of fiber, cleanable. *All items sold as is, all warranties void. Instead of subjecting your legs to a straight jacket, stay comfy in the Prana Women's Jenna Pant while still enjoying the skinny fit you crave. This stylish chino makes skinny comfortable thanks to a lightweight and stretchy fabric that won't restrict your movements or cause discomfort.